Passion for performance above and beyond our needs seems to come naturally to the American consumer. With the advent of the high horsepower multis, many have ignored the small displacement road machines. 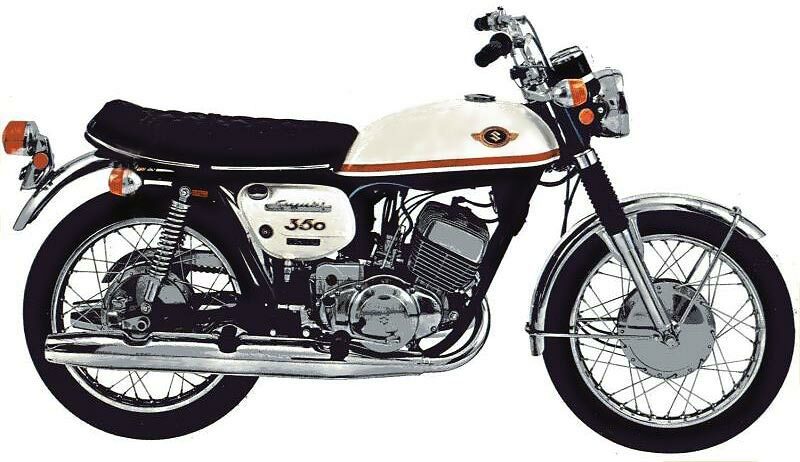 The Suzuki T350 Rebel is one of these machines. In our road testing of the Rebel, we were able to re-examine the true meaning of fine performance. This is not to say the Suzuki Rebel is going to put it to all of the big super machines in a drag race. Performance comes in many forms. Power is one of these, but there is also handling, response and performance when under fire. In just about all the performance areas the Rebel responded with agility and ability meeting or exceeding that of its peers. Needless to say, performance isn't everything, and in the appearance department the Rebel is hard to beat. The machine isn't over decorated nor does it have a super fancy paint job. Rather, the design of the paint scheme and overall lines has been kept quite simple, but in its own way it's very eye appealing. The fire engine red tank and side covers are nicely set off with the right amount of black paint, chrome and polish. The quality of the paint is first class. The Suzuki factory has been hard at work upgrading their machinery, and overall we couldn't find any bones to pick with the quality of the Rebel's finish. The chrome and polish surfaces are grade A and in proper proportion with the painted areas. Another area that seen a lot of improvement with the Suzuki line is comfort. The testing department has apparently gone through a lot trial and error to come up with the right shaped handlebars. In fact we found that the stock bars are probably the most comfortable standard units that we've found on any Japanese machine. To further aid the rider's comfort, the handlebars are rubber mounted to the top fork crown. This reduces to a minimum the amount of shock and vibration transmitted to the rider's hands. The handgrips are the semi-cushioned type, and are comfortable. Levers and controls are easily reached by the rider. The Rebel falls into the medium-weight class and therefore is not in the realm of larger touring type machines. The seating is too firm for the average rider, and a little on the cramped side for the larger person. The position of the foot pegs is high to give lots of ground clearance, but pushes the legs of a tall rider up into a semi-folded position. The vinyl covered saddle could definitely use more padding for those long spells in the saddle. The speedometer and tachometer can be easily read. Here again the Suzuki designers made a wise choice in rubber mounting the bracket for the gauges. This minimises the chance of shock and vibration damaging the delicate gears in the gauges. 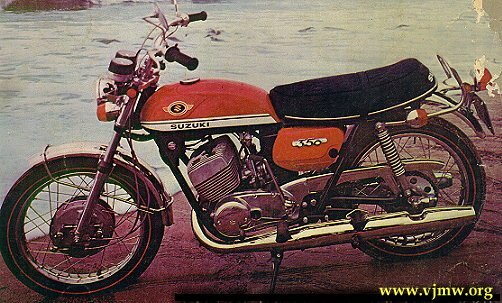 The handling characteristics of the 350 Suzuki are probably its best claim to fame. The machine is very stable and extremely responsive to the rider's wishes. For in-town and short trips, the Rebel performs extremely in the handling department. Once in motion the machine feels very light afoot, and is easy and predictable enough to be thrown almost parallel to the asphalt in a tight corner. Weaving in and out of traffic in town is also an enjoyable and easy task. In windy conditions or when being buffeted by heavy traffic at freeway speeds, the Rebel tended to weave a bit. At the front, the Rebel has internal spring oil dampened forks, with adjustable shocks at the rear. The ride of the Rebel is amazingly smooth. The cushion of the front forks is soft and provides a smooth ride on a choppy road. The rear shocks seemed a little stiff in the spring department, but not bothersome. One strange thing about the forks was the amount of available travel. It would seem that with the soft ride the forks would have a lot of travel. Strangely enough, this was not the case, as the actual travel of the front forks only amounted to three inches. This is about half of what most telescopic units have. It never seemed to pose any problem though. Even with giving away 35 ccs, the Rebel will give any production model 350 a real run for its money. The rate of acceleration of the machine is suprisingly rapid. The engine virtually pulls from the bottom of its power scale (about 4000) on up to about 8000 rpm with amazing quickness. The acceleration is very smooth and doesn't have one particular area where the power output suddenly explodes. This response to the throttle is smooth and predictable, therefore making the machine easy to handle. The transmission and drive system is one of the smoothest we've seen. The six speed gear box aids considerably in achieving the performance that the machine is capable of. Many of the first six speed 250s had shifting problems, but this seems to be past history. Our machine shifted flawlessly throughout our testing period. When the engine was cold there would be a light clunk when we shifted into low from neutral, and after that not a whisper from the gear box. The gear ratios are evenly matched to the engine's power span, resulting in a gear always being available for any situation. The multi plate wet type clutch never offered a bit of complaint. Taking off from a stop is as smooth and quick as desired. The overall gearing also seems to be just right for the available power. This is unusual for a Japanese machine as we have found that most of their mounts are geared to high out of the crate. The carburetion is handled by two 32mm Mikuni concentrics. This may sound like too much carburetion, but they seem to perform quite well. Starting the engine requires a series of prods on the kick lever when the power plant is cold. As compared to other engines of its size and type, the Rebel is cold blooded. Once warmed up, the engine performed perfectly. For short trips through town the Rebel is really enjoyable to ride. The handling, power and shifting performed nicely to the rider's every desire. Out on the open road, though, there were a couple of things we didn't care for. One, was the engine's performance factor in filth (in the 60 to 75 mph bracket or when the rpms ran over the 5,500 mark). For some reason it was very reluctant to accelerate quickly above the 6,000 mark. A change of plugs and fine tuning may cure this. The other thing that was even more disconcerning was the weaving of the machine at highway speeds. We did find that the Rebel was slightly affected by wind and the buffeting of heavy traffic, but this is not uncommon to most of the medium-weight machines. The Rebel, though had a tendency to drift at speeds above sixty. For a tyro rider, (or even and old pro) this does not give you a surplus of confidence. We believe that this weaving would be cured by installing another type of front tire as all of the drifting seemed to come from the front. We could feel the bars move. As mentioned before, we did find the seat was only bearable for about thirty minutes. After about half an hour, we just had to stop and walk around for a minute to get the circulation back. The front and rear anchors always provided us with more than enough stopping power. We did find that using the rear brake continuously for long periods of time, without the added assist of the front binder, produced a little heat fading. This is normal. As expected, the lighting was excellent. Like most other Suzuki models, the Rebel comes standard with turn indicators. We found these to be very convenient, although the indicator lever could be located closer to the reach of the rider's thumb. We did find the lever hard to reach when zipping down the open road at speed. The Suzuki Rebel isn't any competition for the super high performance multis on the drag strip, nor is it down in the ranks of the little popcorn poppers. It's a relatively simple, yet very functional machine. It's not adorned with a lot of frills or dash, but it is very handsome. The overall quality of the machine is A-1, and it's doubtful that one would ever be able to throw too much punishment at the mount short of intentionally flogging it to death. It's easy to ride, has an adequate amount of power and gears, yet it's docile as a lamb at slow speeds. Considering the actual displacement of the engine the performance is surprisingly good. With just a little more foam in the saddle and a front tire change, the Rebel would be a hard machine to beat for what it was designed to do.